There are so many factors to consider when you're trying to figure out what career to pursue. Will it fulfill you creatively? Will it make you rich? Does it involve drinking beer and traveling the world? The truth is, however, you're probably not weighing whether or not the job you're angling for is going to prevent you from finding true love. But at least now you'll have a better idea what you're getting into in that regard, thanks to a new list that reveals the jobs where you're most likely to be single at 40. By analyzing a bunch of census data collected between 2012 and 2016, the folks at the job-hunting site Zippia crunched the numbers for 40-year-old full-time workers, then ranked professions by percentage of their workers of that age who stated they were single. That's not to say that every career included on list is doomed to eternal single-dom, but it illuminates some interesting trends. 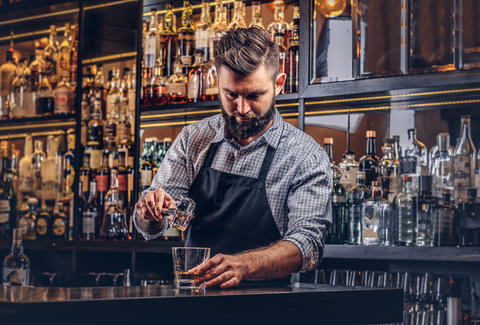 Bartenders nabbed the top spot, with 74% reporting single status, while tile installers and food servers rounded out the top three positions, with 73% and 69% of people reporting to be single, respectively. Bartenders and food servers kind of make sense, considering they generally require working odd hours that may prevent you from dedicating time to a relationship, but the fact that tile installer is so high is a bit mystifying. If you're curious whether your career made the cut, here are the 32 occupations most common among single, older people, along with the percentage of people working in those jobs who reported as much. Besides ranking the occupations, the Zippia team also noted a several interesting takeaways and trends. For instance, many of the professions that made the list are in industries with fairly high turnover rates, which suggests people who pursue them may by more focused on advancing their careers over dedicating time to relationships. A good chunk of the jobs also have a commission element, which may compel people to work longer hours to make more money, and thus not save time for maintaining a relationship. And while the team didn't rank occupations most common among people in relationships, they did pluck a few interesting stats. Specifically, taxi driver is one of the least common occupations for single men, with just 7% reporting as such at age 40. For women, chiropractors are most likely to be in a relationship (just 14% reported being single). Then again, as Zippia points out, it's becoming more and more common to remain single longer by choice, for a whole host of reasons. So, give it a bit of time, and this list may look quite a bit different. In the meantime, hopefully someone is working on a matchmaking service just for tile installers.